Look as stylish as Cadet Sylvia Tilly this Halloween when you put on the Star Trek Discovery Women’s Copper Operations Uniform. 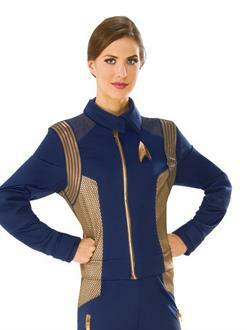 Officially licensed, the lined blue shirt with copper accents is a replica of the style worn by Mary Wiseman as Cadet Tilly in the new Star Trek series. It features copper shoulder braids and a copper Starfleet emblem.